2005-09-07. New. Ships with Tracking Number! INTERNATIONAL WORLDWIDE Shipping available. Buy with confidence, excellent customer service! 1974-10-01. Good. Ships with Tracking Number! INTERNATIONAL WORLDWIDE Shipping available. May not contain Access Codes or Supplements. May be ex-library. Shipping & Handling by region. Buy with confidence, excellent customer service! 2005-09-07. Good. Ships with Tracking Number! INTERNATIONAL WORLDWIDE Shipping available. May not contain Access Codes or Supplements. May be ex-library. Shipping & Handling by region. Buy with confidence, excellent customer service! Souvenir Press, 2005-04-01. Paperback. Used:Good. London: Souvenir Press, 1974 Hard Cover. Very Good/Very Good. Souvenir Press, 2005-04-01. Paperback. Good. London: Reader's Union, 1975 Book Club (BCE/BOMC). Hard Cover. Very Good/Very Good. London: Reader's Union, 1975 Book Club (BCE/BOMC). Hard Cover. Near Fine/Very Good. New York: Random House, 1973. MARATHON- Alan Lloyd- Random House-NY- 1973-1st Edition-1st Printing-Stated- Hardcover:-8vo- Near FINE/Near FINE dj is price clipped, some light rubs, but bright and clean- printing line as per Random 1st -9-8-7-6-5-4-3-2- 1st Edition- 211pp are clean, no tears or writing-tight textblock and spine- "An account of the clash of two great civilizations at Marathon, twenty-two miles from Athens, where 9,000 Greek citizens, part-time warriors only, defended their city against Darius and his Persian army of 30,000. "- Non-fiction-history-ancient-Greek-Persian-Battle of Marathon (1114). 1st Edition-1st Printing. Cloth. Near FINE/Near FINE. 8vo - over 7¾" - 9¾" tall. Random House. Hardcover. 0394481356 With Very Good dust jacket. . Fine. 1973. Random House, 1973. Hardcover. Good. MARATHON: THE STORY OF CIVILIZATIONS ON COLLISION COURSE. Reader's Union, Newton Abbot, 1975, Book Club edition. 211 pp, 8vo (8 1/8" H), hard cover in dust jacket. B&w plates. 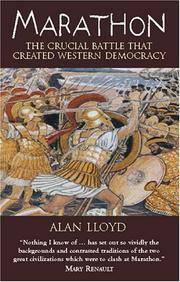 "...reads on occasion like a suspense thriller, as (Lloyd) tells of the clash between two great civilisations at Marathon, the battle which in so many ways settled the course of history for the Western world. On a plain twenty-two miles from Athens, 9,000 Greek citizens, part-time warriors only, defended their city against Darius and his army of 30,000. The Persians had already subdued the Greek colonies in Asia Minor and Thrace, and intended to install Hippias as puppet-king in Athens. A yet fragile Athenian democracy might also have to face insurrection from within..." Small soft bump to top corner of textblock, shallow scuff on fore-edge of textblock, minor edge wear, slight bump to top of spine. Dust jacket has light edge wear/wrinkling, two tiny tears at bottom of rear hinge, moderate rubbing - mainly on rear panel. VG/VG-. Souvenir Press, 1974. 1st Edition. Hardcover. Very Good/Very Good. The jacket is lightly rubbed and edgeworn. Light foxing on the top page edges. One tape mark on the ffep, otherwise internally clean and tightly bound. READERS UNION. Hardcover. B000ZUDJ2G . Very Good. 1975-01-01. Souvenir Press Ltd, 1974-10. Hardcover. Good. Souvenir Press. Hardcover. 0285621513 Book has a dust jacket. Dust jacket is creased around the edges. Pages are not marred by notes or highlighting. The cover and spine have some wear but remain intact. Embossed font to the spine is bright and intact. -- Re-Read is a social enterprise that trades in and recycles books to reduce waste, save them from landfill and provide services and activities that promote literacy, education attainment and quality of life in South Yorkshire and supports Askern Community Library. All overseas shipping is via Airmail. . Fair. London: Souvenir Press, 1974. 210pp. Plates.. First U.K. Edition. Cloth. Vg/Vg. 8vo. Souvenir Press , 1974. Book. Very Good. Hardcover. hardback, 8vo, foxing to top edge o/w very good in a well preserved dust jacket, col'd frontis, b&w plates, 211pp. Newton Abbot: Readers Union, 1975. Reprint. Locale: Greece. Hardcover. Readers Union book club. 211pp + 8 unpaginated pages of b/w pictures. ** flaws: Dust Jacket has peeled area from price label removal. Water stains on rear panel, and tiny tears. Book pictures have light water stains, and some adherence marks. Good / Fair to Good dust jacket. Hardcover. Good+/Fair. Newton Abbot: Readers Union. A crisp and tight copy. Lightly sunned jacket spine. . Near Fine. Hardcover. 1975. READERS UNION. Used - Very Good. Very Good condition. Good dust jacket. United Kingdom: Souvenir Pr Ltd, 2004. Soft cover. As New. 8vo., 210pp, softcover, Souvenir Press, London, 2004 Vivid account of the battle of Marathon and its implications. As new. Souvenir Press 2004. Softcover octavo (near fine); all our specials have minimal description to keep listing them viable. They are at least reading copies, complete and in reasonable condition, but usually secondhand; frequently they are superior examples. Ordering more than one book will reduce your overall postage costs. Random House, Incorporated, 1973. Hardcover. Very Good. Disclaimer:A copy that has been read, but remains in excellent condition. Pages are intact and are not marred by notes or highlighting, but may contain a neat previous owner name. The spine remains undamaged. At ThriftBooks, our motto is: Read More, Spend Less.Dust jacket quality is not guaranteed. Readers Union. Very Good in Very Good dust jacket; Bookplate and penned I on blank front . end page, else clean and tight. Mild scuffs on DJ.. 1975. Hardcover. 1.1 x 8.5 x 5.5 Inches; 208 pages . Condition: Very Good in Very Good dust jacket; Bookplate and penned I on blank front end page, else clean and tight. Mild scuffs on DJ. London: Souvenir Press, 2004. No marks or inscriptions. No creasing to covers or to spine. A clean very tight copy with bright covers and no bumping to corners. 210pp. . Paperback. Very Good. 8.5 x 5.25 inches. Souvenir Press. 1974 Souvenir Press first British edition hardback; Very Good with Very Good price-clipped dj; UK dealer, immediate dispatch . Very Good. Hardback. 1st Edition. 1974. Readers' Union. 1975 Hardback. Brown cloth in Dustwrapper, sl. worn at edges. Very Good (Very Good). Reader's Union. Hardback with cloth boards in very good condition. Dustwrapper in good condition. Please allow 3-5 days for delivery. No quibble refund if not entirely satisfied. . Very Good. Hardcover. 1975. Souvenir Press. PAPERBACK. 028563688X Book is in good condition. Cover has some wear. Fingermarks present. Page discolouration present. Creasing present. Cover differs to one shown. -- Re-Read is a social enterprise that trades in and recycles books to reduce waste, save them from landfill and provide services and activities that promote literacy, education attainment and quality of life in South Yorkshire and supports Askern Community Library. All overseas shipping is via Airmail. . Good. 2005. Souvenir Press Ltd. Hardcover. GOOD. Spine creases, wear to binding and pages from reading. May contain limited notes, underlining or highlighting that does affect the text. Possible ex library copy, thatâll have the markings and stickers associated from the library. Accessories such as CD, codes, toys, may not be included.